Looking for kitchen extension ideas under £200,000? With that much to spend, you should be able to create a large, open plan kitchen with state of the art fittings and fixtures. A kitchen extension is a popular addition and worth the investment if you have money to spare. Covering everything from glass box extensions to statement contemporary additions with bi-fold doors for popular indoor-outdoor living, find inspiration with our pick of stunning kitchen extensions, all under £200,000. And, if you're in the market for practical advice, don't miss our guide to planning and designing a kitchen extension. Find out, too, how to cost your kitchen extension. Rather than a simple kitchen update, homeowner Sarah Bradley opted for a side-return extension to add space to the terraced home she shares with partner Kevin Wilson and son Alejandro. The result was a bright and spacious open plan kitchen perfect for entertaining guests. Architect Your Home completed this extension for a total of £108,000. Find out all you need to know about designing an open plan kitchen and find practical tips on building a side return extension in our guides. James Hewitt and Pamela Sampson spent 12 years renovating their Victorian home – carefully selecting new, vintage and reclaimed pieces for their long-awaited kitchen extension. Sourcing materials yourself is a great option if you're committed to quality, but don't want to exceed your budget. In total, their dream extension cost £131,600. Be inspired by more industrial style kitchens in our design gallery. This daringly designed glazed kitchen extension creates a feeling of sitting and eating outdoors while being protected from the elements. A great alternative to a brick extension, a glass box extension floods the space with light while making a striking design feature. This project, including landscape gardening and the addition of a bathroom upstairs, came in at £120,000. Discover how to plan and design a glass extension for your home. 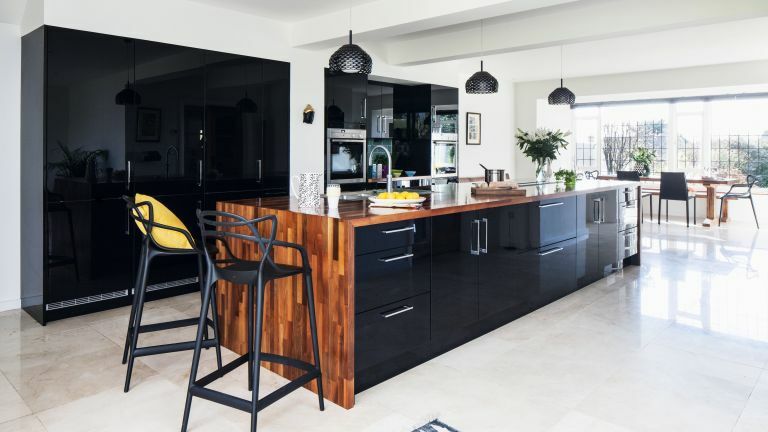 Lucy and Mark Gregory extended their semi-detached period house to create an open-plan kitchen extension with a striking monochrome colour scheme. A beautifully crafted kitchen island creates a focal point within the space that's perfect for cooking and entertaining guests. This striking addition cost Lucy and Mark £115,300. Find more kitchen island design ideas in our design gallery. In many houses, the kitchen was originally designed as a cooking space rather than a social environment for the whole family. With the changing way that we use our homes, the kitchen-diner has become much more central to life. This beautiful, contemporary kitchen has been extended and combined with other rooms to double its size, creating a social environment. See more contemporary kitchen designs in our gallery. Moving to get a bigger house isn’t always the answer. If you live in a suburb, just outside of the city that you work in, moving further away might not be that cost effective once you factor in travel costs. An extension turned out to be the perfect way for owners Ellie and Steve Hodgson to get the home that they wanted, without having to compromise on location. Find out everything you need to know about building a single storey extension in our guide. You don’t have to add loads of space to your house to turn it into something practical that suits your lifestyle. It could be as simple as moving one or two walls and adding an expanse of glass. Doing so transformed this kitchen from something regular, into something unique – filling the room with light and adding those all-important square metres to improve the owner’s lifestyle. See more glass extension design ideas to inspire your build. The side return is often an under-utilised space. What it should actually be, is an opportunity to add space to your kitchen. This extension provided the perfect opportunity to introduce roof glazing into the space without altering the existing roof and has transformed the kitchen into a bright and airy space. With kitchen extensions, there seems to be no such thing as too much glass. The more natural light you can get into a room without compromising energy efficiency, the better. This glass kitchen extension lends itself perfectly to the industrial decorating trend, contrasting brilliantly with stainless steel and the respectful use of natural materials like wood and stone. Adding a new kitchen extension is a brilliant opportunity to add a touch of luxury to your home. If you’ve got an unconverted basement below your kitchen or can afford to add one, use your renovation to integrate a wine cellar into your living space. This beautiful yet simple kitchen conceals a luxurious wine cellar right below the floorboards. See our guide to building a wine room or wine cellar for practical advice. Combining full-width sliding doors and a contemporary design scheme is a brilliant way to make a kitchen extension seem huge. You can also be clever with your choice of flooring and how you lay it. If your floorboards span the length of the room, you can make the room appear much longer than it is, while laying the flooring across the room from wall to wall, will make it appear wider. This kitchen contrasts its contemporary white colour scheme with parquet floorboards. Find out more about choosing the best sliding or bi-fold doors in our guide. If you’ve always thought about transforming your home with an open-plan design, adding a kitchen extension could be the way to reorganise your space. This open-plan kitchen diner and living space was created to make better use of the kitchen and open the back of the house up to the garden. Adding a second storey on top of a kitchen extension is a cost-effective way of increasing the size of your bedroom and bathroom space upstairs. Two-storey extensions are rarely double the price of single storey extensions, because the cost of expensive elements like the roof and foundations is spread over two floors. The owners of this home created a sleek, open-plan kitchen extension with extra rooms above. Find out how to design and plan a two storey extension in our guide. If you have a passion for cooking, extending your kitchen is going to be high on your list of home improvement projects. This New York loft-style kitchen extension was designed with cooking in mind, with its relaxed, open-plan scheme, ample storage and professional-grade range cooker. See more of this dream kitchen and read the full interview. After removing the existing conservatory and extending off to the side, the owners of this house asked their builders to knock the dining room through to make an open-plan space. Next, they started work on the kitchen. ‘I wanted a homely feel,’ Alex says. ‘Wood was a key theme for us.’ In keeping with Pippa’s earthy scheme, oak runs through the extension in the window frames and the doors. Oak-veneered plywood units are topped with granite worktops to continue the natural look. See more of this kitchen extension and read the full interview.